IESI provides a comprehensive range of asbestos abatement services to enable the people who control governmental, commercial, industrial and residential facilities to meet their abatement and regulatory obligations in the most efficient and cost effective manner, with considerations for critical time paths and time constraints realized. IESI is fully equipped with the state of the art equipment and facilities to provide removal and proper disposal of any type of asbestos containing material such as HVAC ducting, acoustic ceilings, furnace insulation, piping, sprayed-on fire proofing and sound insulation, floor and ceiling tiles and any other asbestos-containing products. At IESI we are committed in employing the latest innovative and cost efficient abatement techniques and methods in order to minimize the interruption to your operations, while performing all procedures in accordance with federal, state and local regulations. 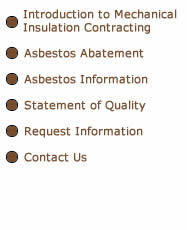 Asbestos Abatement Specialists are fully trained, licensed and experienced in asbestos abatement. Our abatement specialists are important to our company and ultimately to your project. IESI has implemented a rigid health and safety-monitoring program to insure our abatement specialists have clean health by providing regular medical examinations, fit tests for respiratory devices and continued training and education. In certain situations, encasement of an asbestos contaminated area may provide an equally satisfactory and less costly solution to the dangers of asbestos exposure rather than complete removal. Procedures may include encapsulation, coating and / or removal. IESI's procedures for containment meet federal, state and local standards.